I'm finally getting around to sharing another recipe from the Apple Challenge (you can read about that here)! These apple chips are fairly easy to make but do take a lot of time to bake. The end result is yummy though, and definitely worth it! They are the perfect recipe for a lazy fall Saturday. I think my favorite part is that they make your house smell like apple pie ALL day long! Lay a piece of wax paper on your cookie sheet and then lay the apple slices as close together as possible. Mix the cinnamon and sugar together and sprinkle on the apples. Bake at 210 for an hour. Check on apples every 30 minutes until they have reached desired crispiness! 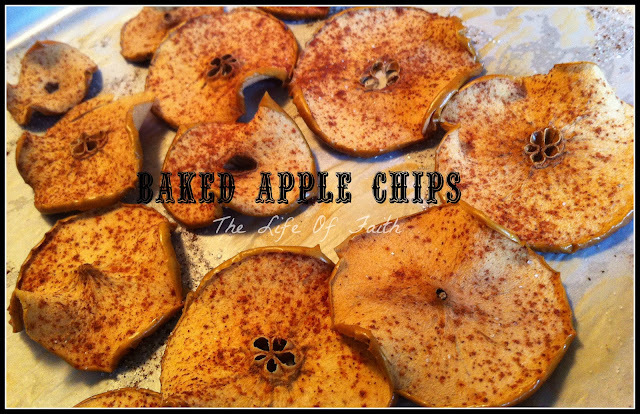 If you want the apples to still be soft (like dried apples) then only bake them for about 2 hours. Just store in a plastic bag and enjoy your healthy apple treat! We are going apple picking again tomorrow! I will definitely make these. And who wouldn't like their house to smell like apple pie.all.day! OOOOOH my kids will LOVE these! Stopping by from the Sunday Social:)Enjoy your week ahead. I was JUST looking for a way to do this and happened upon your blog on the blog hop over at the Sasse Life. I'm definitely going to make these amazing little chip up soon! Thanks for the tute! Found ya on Sunday Social! Those apple treats look amazing!! And perfect for fall! It is cute and yummy! I hope you will share this on The CSI Project this week. The challenge is Fall Food and this is perfect. The link ups start Wednesday night. Come on over everyday for fall recipes. Each week is a new challenge so come over and see what is going on. they look DELISH! so yummy :) thanks for linking up at Heart+Home again! These are easy, delicious, and your house smells amazing ! THanks for sharing at MTM!